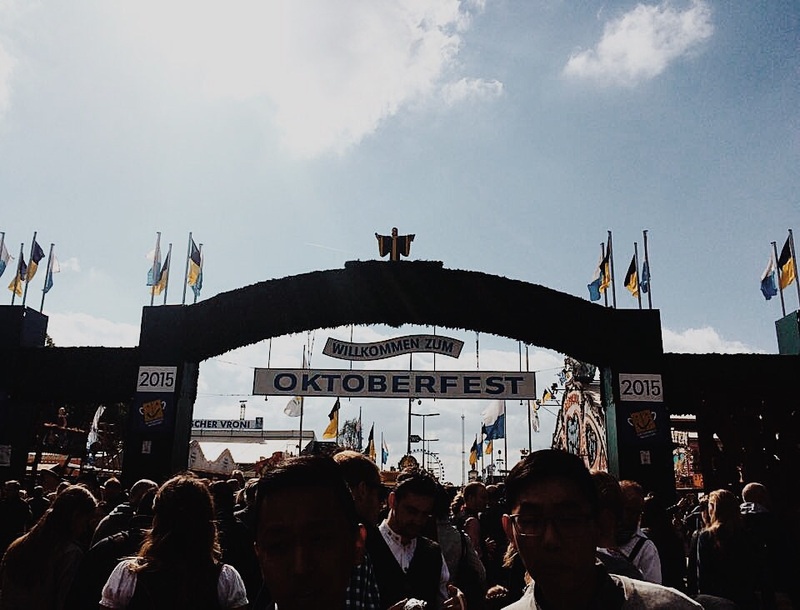 Two weeks ago I ticked #67 off my Bucket List and jumped on a flight headed to Munich, Germany for my first ever Oktoberfest experience. Due to the copious amount of beer I consumed, lack of sleep I had, and the few too many drunken stumbles that occurred, my body is still recovering! 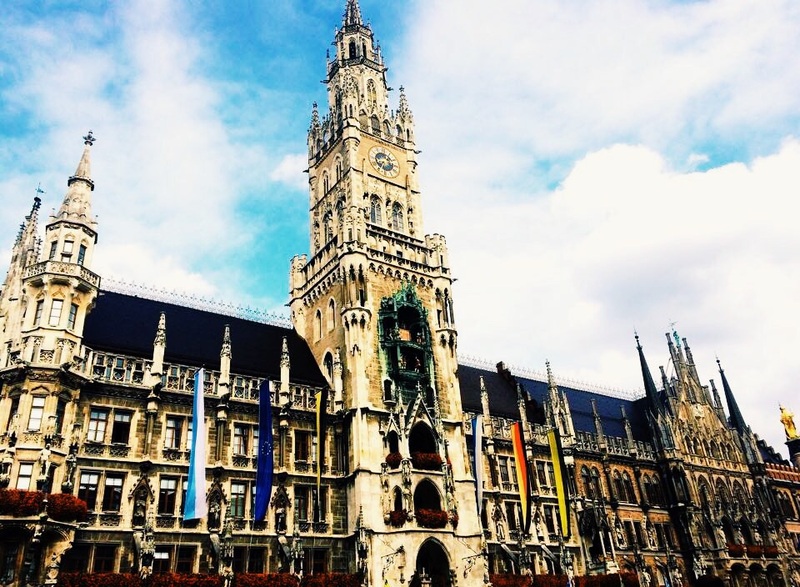 Once I had touched down at Munich Airport, I gathered my bags and jumped on the first S Bahn train into the city’s centre – Marienplatz. I used the 1 hour train journey wisely, surfing the internet on my phone to try and source out the best places in the city to find a nice (and reasonably priced) dirndl. A dirndl is the traditional Bavarian dress women wear during special celebrations in the south of Germany, in particular once a year during Oktoberfest. The traditional costume you will commonly see the men dressed in is called lederhosen. Now, being the extremely organised person I am, I had managed to leave my original plan for purchasing a dirndl online until the final days before I was due to fly out to Germany, leaving me with zero time for delivery. I therefore had no choice but to cross my fingers and toes and hope that I would be able to find the perfect dirndl on a late Friday afternoon upon my arrival in Germany. As soon as my train pulled into Marienplatz, I exited the underground only to be welcomed with a force of icy cold air and the many confused looking faces of the Munich locals as to why on earth the girl in front of them was dressed in a skirt and T-shirt (I clearly wasn’t in Spain anymore). 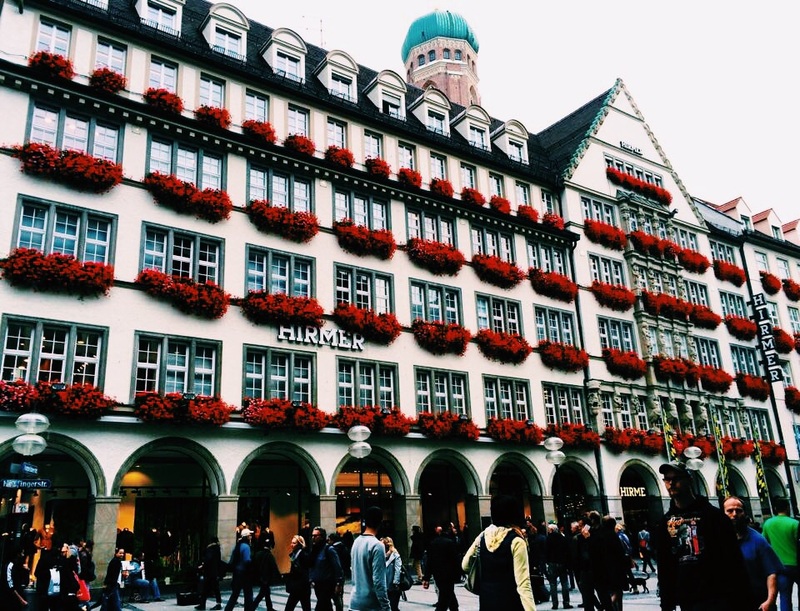 The city centre was beautifully decorated in vibrant red flowers and traditional flags which hung from the surrounding buildings. Bavarian music played throughout the streets and people crowded around the many tiny pop-up stalls selling pretzels, currywurst and of course, beer. The vibe of the city felt so alive and festive, almost as though Christmas had come 3 months early! My concern around finding a traditional outfit quickly disappeared once I looked up to see the 101 shops in front of me displaying dirndls and lederhosen. After one hour of trying on around 10 different styles of dirndls in the first shop I had entered, I had finally decided to settle for one. 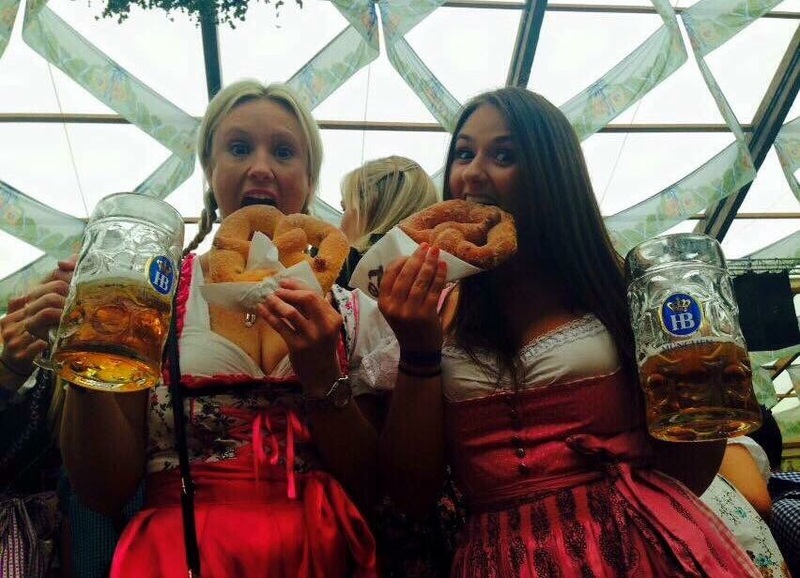 Now, one of the biggest pieces of advice I can give to women in particular who are planning to attend Munich’s Oktoberfest is to in fact invest a little more money into purchasing a good quality, knee length dirndl as opposed to opting for one of the cheaper “mini” or costume shop versions. The German locals take great pride in wearing the traditional outfits and will tend to mock and make fun of people wearing the cheaper costume versions. Expect to pay anywhere between €80 to €150 for a decent, quality outfit. If you can’t afford to purchase an outfit for such a price then I would recommend wearing casual clothing instead. TIP! Girls – If you are going to wear a dirndl then you must ensure you have the knot of your apron tied to the correct side, depending on your relationship status. A knot tied to your left side indicates that you are single, a knot tied to your right side indicates that you are unavailable, and a knot tied to your back indicates that you are widowed. Now lets get to the part where all the fun happens, the beer tents! It will set you back no money at all to gain entrance to either the main Oktoberfest grounds or one of the 14 different beer tents on offer, however, that said, the beer tents fill with people extremely quickly and unless you are able to find a table to sit, you will not be served any food or drinks by the Bar Wenches. The first day we attended was during the weekend on a Saturday (the most chaotic day), where we arrived an hour and a half prior to the doors opening at 9:00am just to try and secure a good spot in the crowd waiting outside . Now when I say crowd, by no means underestimate just how many people I’m talking! As soon as the whistle was blown and the doors were swung open there were thousands of people running across tables, jumping over the walls, pushing and shoving intensely just to try and ensure they were inside in time to secure a table! Once we had finally made it inside we all squeezed in tightly around a table and ordered our first beer from one of the Bar Wenches. 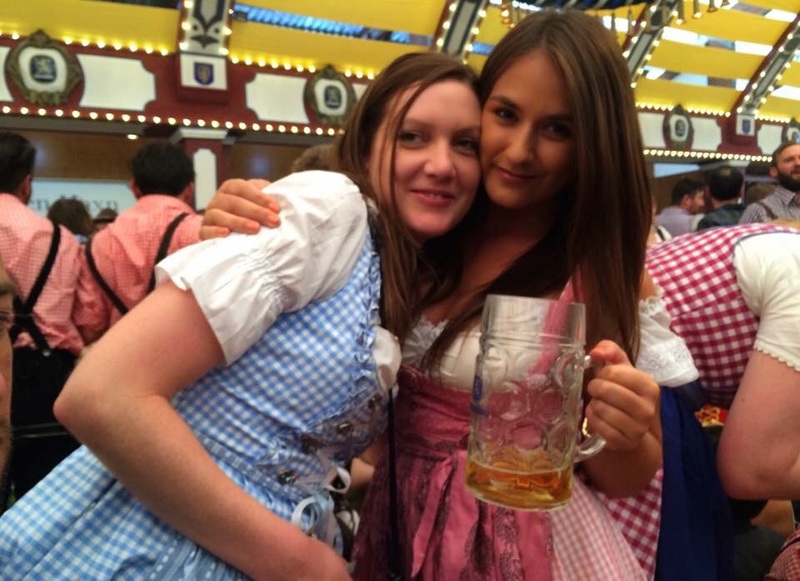 It cost around €10 per stein of beer, however the Bar Wenches make their money off the tips they receive and if you want to ensure that they return again to your table for a second round then you must tip. I found that with each stein I ordered I would pay €15, €5 of which was a tip. If you are lucky to find yourself with a friendly Bar Wench assigned to your area, it will make your experience a whole lot more enjoyable! I recommend heading over to the Lowenbraugh tent and seeing our old mate Christine – she was so lovely and each time she’d return to our table she would join in on the fun and have a drink with us. That said, be certain not to go doing anything to piss off a Bar Wench- they basically run the joint and will have you kicked out without hesitation. The atmosphere inside the tents was absolutely insane! People stood up on the tables and benches singing and chanting at the top of their lungs, dancing carelessly along to the music of the live band. Others who were a little more brave and had cast iron stomachs would test their fate a stand up on a table attempting to scull a full stein whilst thousands of people jumped in on the action cheering them on. If you want to try your luck at sculling a stein but are unsure whether you can completely finish it all then you may want to think twice about doing so! In the case you don’t finish, you will have a room full of people booing and throwing pieces of pretzel your way! An unpleasant discovery was the toilet situation. It’s a whole different ball game in comparison to the chaos happening inside the beer tents. There’s no “line” of girls and guys waiting patiently for a cubicle to become free, no, instead you are sandwiched (I had my hands up in the air and literally couldn’t move) by hundreds of other girls, viciously pushing and shoving trying to move forward whilst attempting to avoid the large pools of vomit and smashed beer steins on the grounds. Unfortunately I can not seem to erase the images of girls aggressively pouring beer on each others heads and giving up all sense of dignity and bladder control to squat against the walls and let nature take it’s course. Either avoid breaking the seal in the morning and go to the toilet when there is a lull or resort to wearing a nappy. After a night of attempted recovery I returned on the Sunday to repeat the previous day all over again, shying away from no stein of beer headed in my direction. In my opinion Sunday was by far the best day to attend, still attracting the weekend crowds however being no where near as chaotic to the previous day. 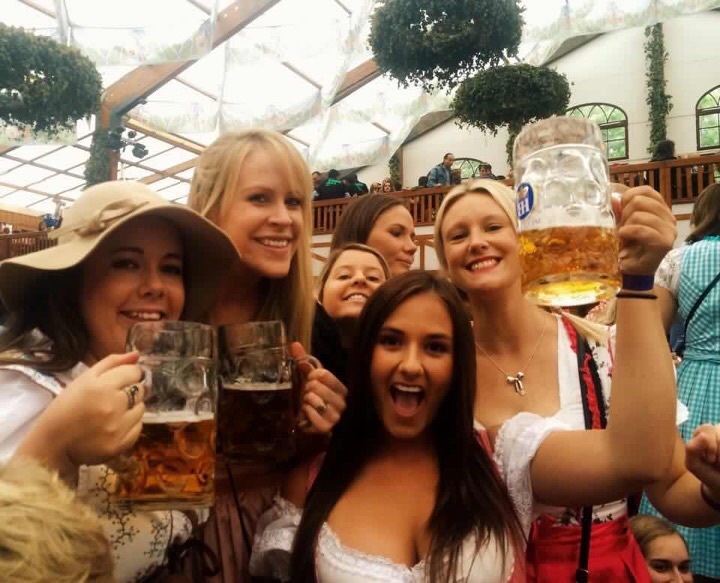 The most common reason people attended Oktoberfest is to obviously enjoy themselves by drinking a little too much beer and to join in on the lively, fun atmosphere and entertainment that occur within the beer tents. If, however, you wish to have a break from all of the madness, take a stroll around the outside grounds where you will find entertainment, food and shopping galore! 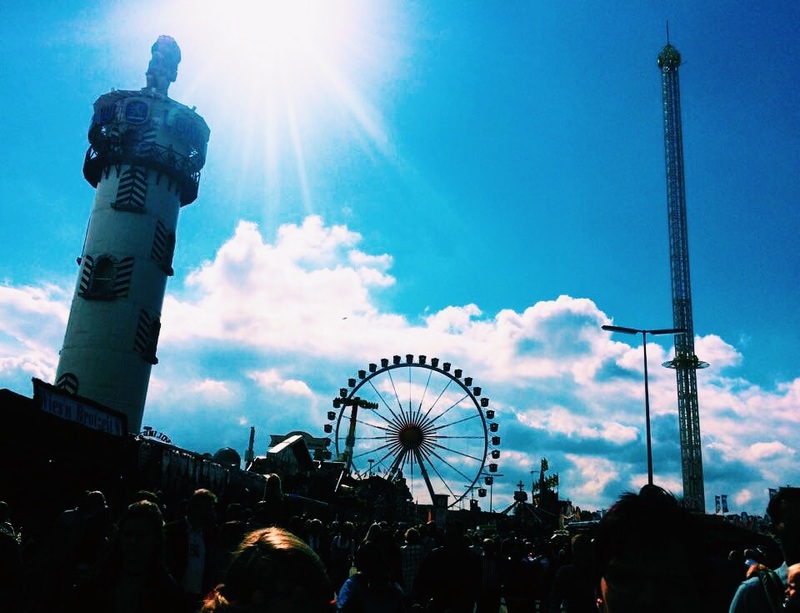 With many rides and attractions to let your hair down on, mouth watering food to satisfy your tastebuds and plenty of shopping on offer, it’s almost impossible to run out of things to do! 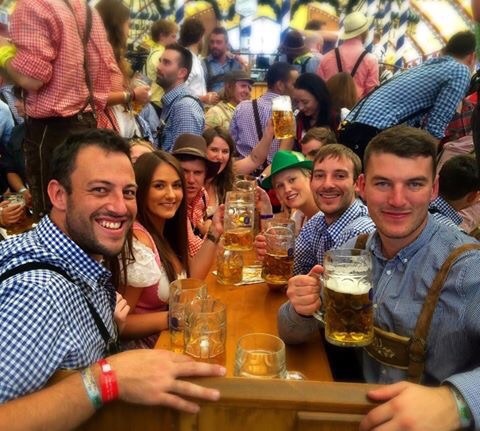 When it comes to a place to rest your head after a big day of drinking you will want to try and secure accommodation in close proximity to the Oktoberfest grounds. 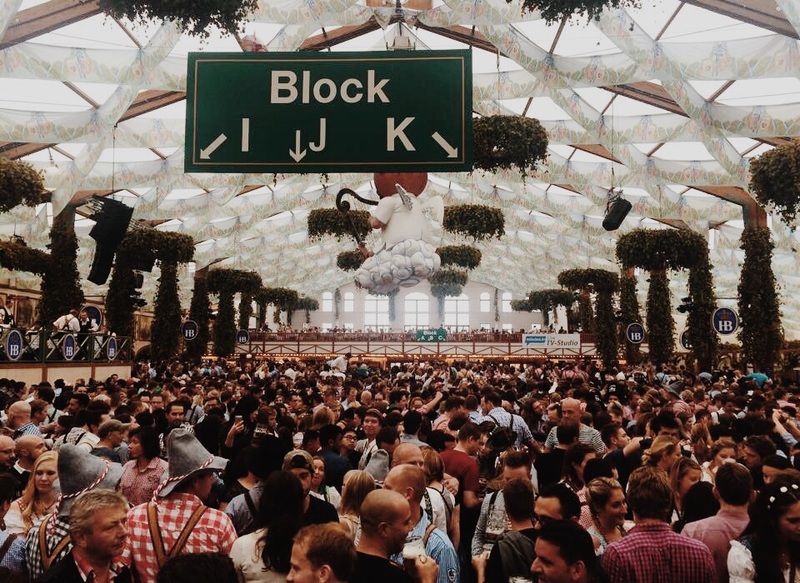 If you are unable to find a place within walking distance to the grounds then do not worry, the “Hackerbrucke” train station is only a 5 minute walk away with lines running from all around the city. We stayed at the Meininger Hotel which was in the absolute ideal location, only a 5 minute walk away from both the Oktoberfest grounds and the train station. The room we stayed in was great and the hotel had a buzzing atmosphere with the party continuing on in the downstairs bar after our return each night. Oktoberfest you certainly did a number on me, but do I regret any of the over drinking or madness? Not one single bit!